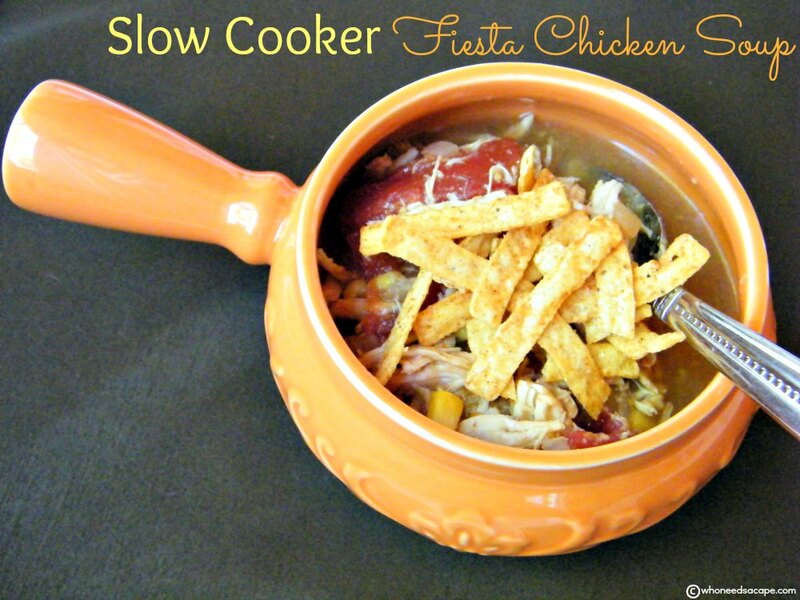 Slow Cooker Fiesta Chicken Soup - Who Needs A Cape? 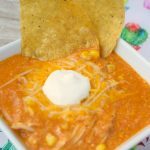 Slow Cooker Fiesta Chicken Soup the most amazing combination of flavors that will leave you wanting more. Tomatoes, chicken and spices blend wonderfully. 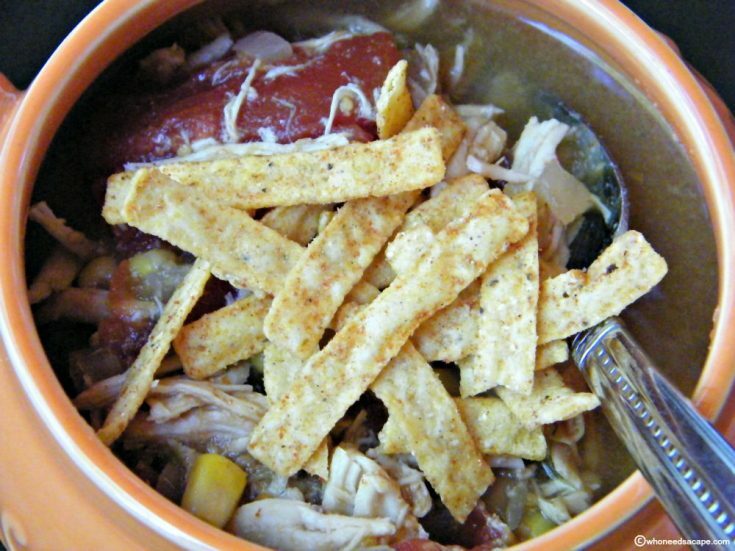 You’re gonna love the aroma from this Slow Cooker Fiesta Chicken Soup while it cooks away all day in your slow cooker!!!! Yummmmm, not overly spicy just loaded with flavors that come together in one delicious dish. 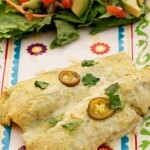 Add in more spice if you desire, or customize with black beans or pinto beans. Serve with a dollop of sour cream or tortilla strips on top and don’t forget the cornbread! 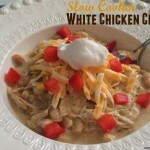 Another fabulous slow cooker meal that you’ll be adding to your rotation! To be really honest – this soup made me fall in love. 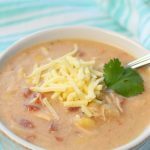 Slow Cooker Fiesta Chicken Soup may look like a simple recipe (which it is thankfully) but it has such amazing flavor. It’s so delish on a cold winters night and it’s so perfect even on a hot summers day. That’s how good this soup is! You can eat it year round! 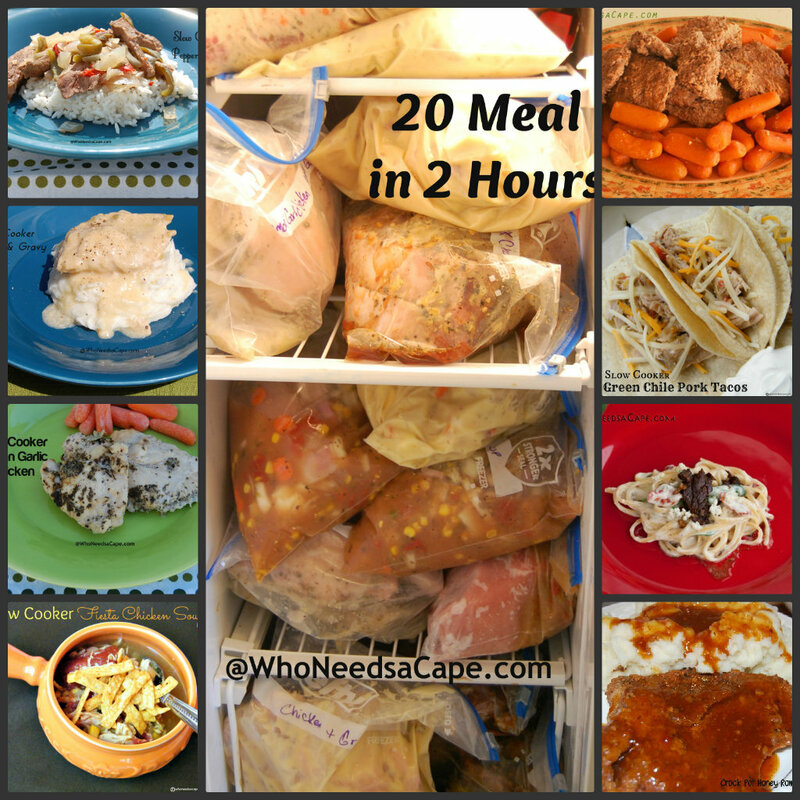 This recipe is part of our 20 Meals in 2 Hours Slow Cooker/Freezer Meals post, click HERE to see all the other amazing meals you can prepare in such a short amount of time! We have all kinds of delish meals in there! 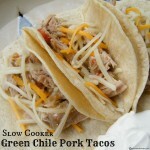 Add all ingredients into slow cooker and cook 6 hours on low. Return chicken to soup and finish cooking time. Optional: Garnish with sour cream and/or tortilla strips. This is what I call comfort and easy food! Visiting you from Miz Helen’s full plate. Our little local Tea Room makes a Fiesta Chicken Soup that I just love and I know I will love your as well, it really looks delicious! Hope you have had a great weekend and thanks so much for sharing your awesome soup with Full Plate Thursday! This was really good soup! But it was way too spicy! I had to mix some white rice into it after cooking to make it so we could eat it. Any advice on how to tone it down without changing it too much? I’m not sure if it was the rotel or the salsa verde that made it so hot. More than likely it was the Rotel, next time I would use diced tomato if it was too spicy. Yup – the rotel tomatoes are really spicy – if you want to tone it down substitute regular canned tomatoes instead of the rotel 😉 the Salsa Verde is not super hot and it would change the flavor to omit that! Remember to look for “mild” Rotel. You may have chosen “Hot”. Same with the salsa verde. duh – I can’t believe I didn’t think of that! Thanks Linda Sue! Thanks! I tried it again with mild rotel, and it was perfect. I used mild title and mild salsa verde and it was still too hot for us as well. Next time I’ll do regular tomatoes too! I haven’t done much slow cooker cooking because of raw chicken… I was reading some of your other recipes too and want to give some of them a try. Just to clarify, I put raw chicken in the crock pot for all the recipes, even with the other ingredients and it’s fine? -Crock pot newbie! I love anything close to Tortilla Chicken Soup. This recipe looks great. Pinning! LOVED this! 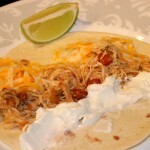 We also added some shredded cheese, avacado and sour cream and a bit of cilantro before serving. Should I cook the ck first to shred or will it shred on its own? This looks great!! Quick question on the freezer meal: do I freeze a of the ingredients raw (so before I cook it in the slow cooker) or do I cook it in the slow cooker and then freeze it? Thank you! Hi Jasmine, All ingredients for this particular recipe are uncooked prior to freezing. When you are ready to cook, place into your refrigerator the night before, in the morning dump contents into slow cooker. Hope you enjoy! Marcy, I’m sure you can leave out the lime juice and still have it be flavorful. Hope you enjoy!